Open wings while resting generally distinguishes the Spread-wing Skippers (Pyrginae), the second largest group of skipper butterflies, from other North American skippers. The North American population divides some species among approximately twenty different genera, making for a relatively diverse subfamily. Most North Americans recognize them as duskywings, Checkered-Skippers and Scallopwings, the three genera with the broadest North American ranges. The top picture shows a Texas Powdered Skipper (Systasea pulverulenta), one of two native Systasea species. 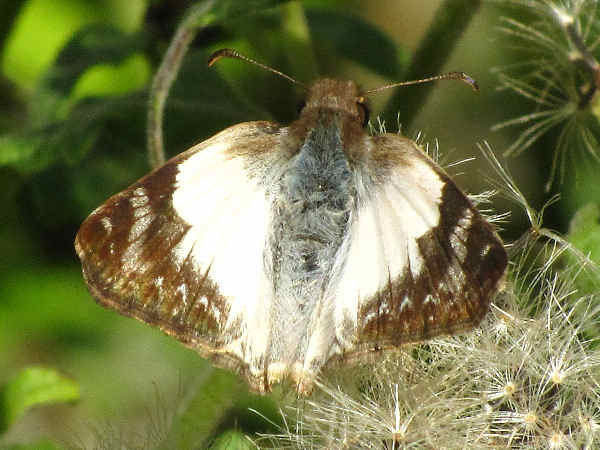 Like its relative the Arizona Powdered Skipper, it is defined by the soft look of the top wing pattern. Many of the spread-wing skippers are region based. Here are three examples. The Erichson’s White Skipper (Heliopyrgus domicella), one of two native Heliopyrgus species, inhabits border areas from Texas to Arizona. The picture shows the Erichson’s resemblance to many Checkered-Skipper species. 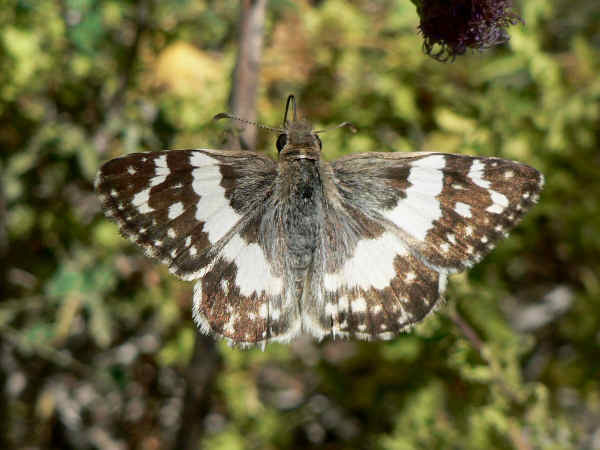 However, the strong white bands across the wings serves to differentiate it from Checkered-Skippers. The Laviana White Skipper (Heliopetes laviana), one of five, white winged, native Heliopetes species, breaks the brown wing skipper mold. Its range extends from South American to the southern border areas of the United States, in areas that host plants in the mallow family, the food plant for the caterpillar. 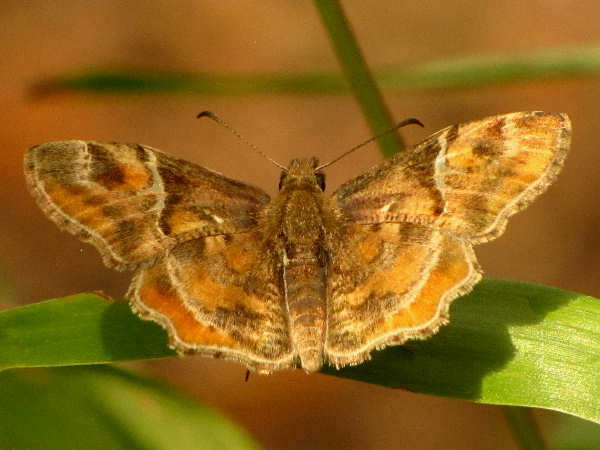 The Sickle-winged Skipper (Eantis tamenund), the sole North American Eantis representative, lives in many parts of Central and South Texas. Physically, it grows to an above average skipper size. The rounded or sickle shaped forewings provide an explanation for the name. The wings tend to show a bit more color than represented in the picture. Depending on the light, a purple tint highlights the wing borders. The caterpillars feed on citrus tree leaves. Adults nectar on a variety of flowering plants. The following three pictures provide a baseline for comparing the look of the Duskywing skippers. 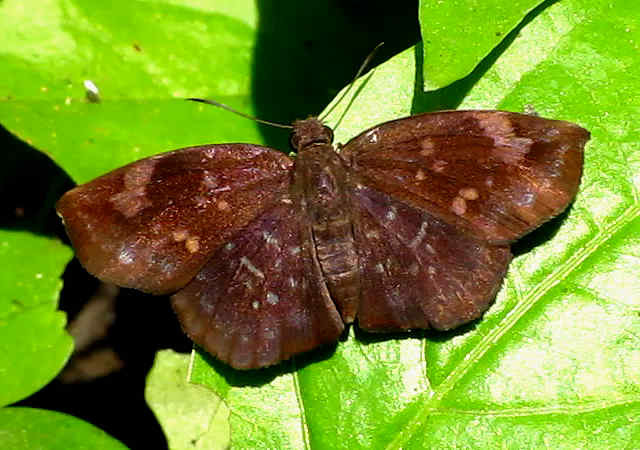 Horace’s Duskywing often can be found along Southeast coastal areas. 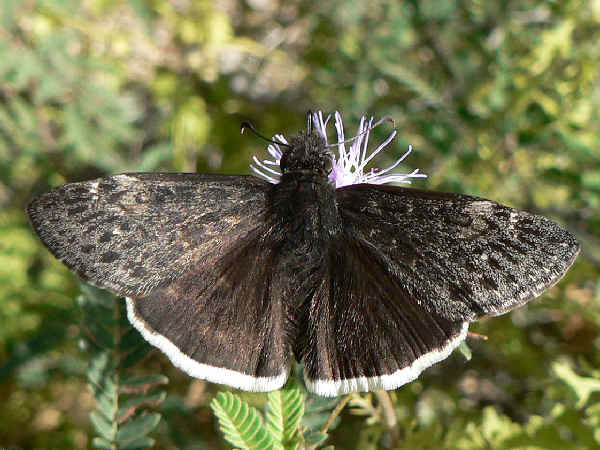 The presence of the white border on the bottom wings of the Funereal Duskywing (Erynnis funeralis), for example, helps identify it. 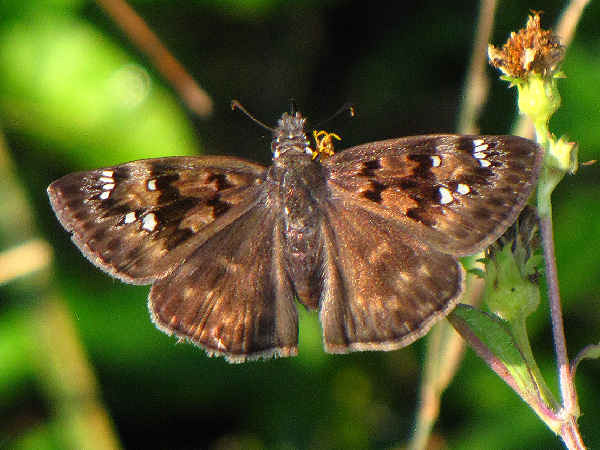 It’s a fairly common Southwest species, and while the Pacuvius Duskywing also has a white wing, the patterns on the top wings differentiates the two species. While Rocky mountain Pacuvius Duskywing species show a white skirt at the bottom of the hind wings, West Coast species show a brown skirt. 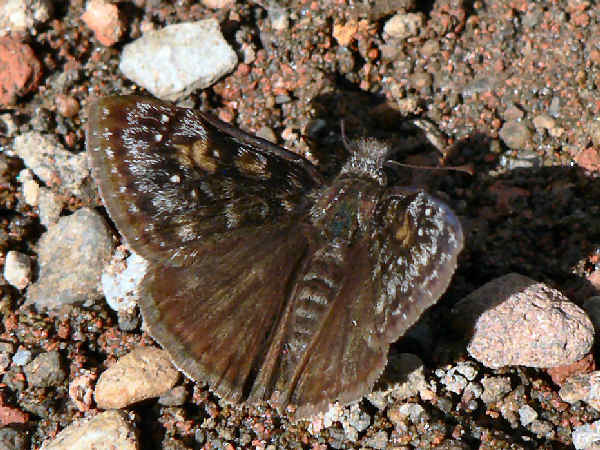 The brown skirted form looks very similar to the Persius Duskywing (Erynnis persius). The picture highlights the grayish marks on the edges of the forewings. Together, both forms of the Pacuvius Duskywings call areas of western North America that hosts the larval food (Ceanothus or California Lilac) home. Many people associate spread-wing skippers with the Checered Skippers. They are common in most of the United States, and easily seen as they perch on small flowers around residential areas. 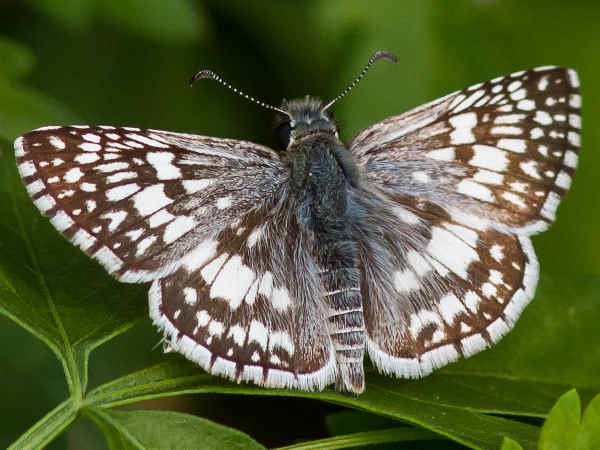 Adaptable to both cold weather and tropical environments, eight Checkered-Skipper species (Pyrgus) call North America home. With the exception of northern New England, southern Texas and some desert regions in the Southwest, the Common Checkered-Skipper (Pyrgus communis) represents the genus. 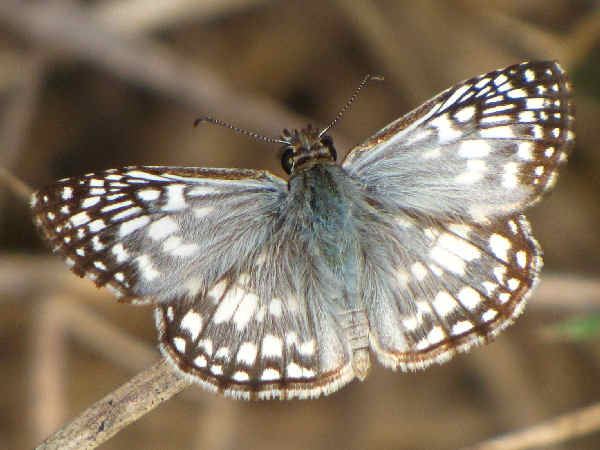 The picture of the Tropical Checkered Skipper highlights some basic field identification marks, blue hair on the body, dark wings covered with light to white patterns and pronounced fringing on the wings.